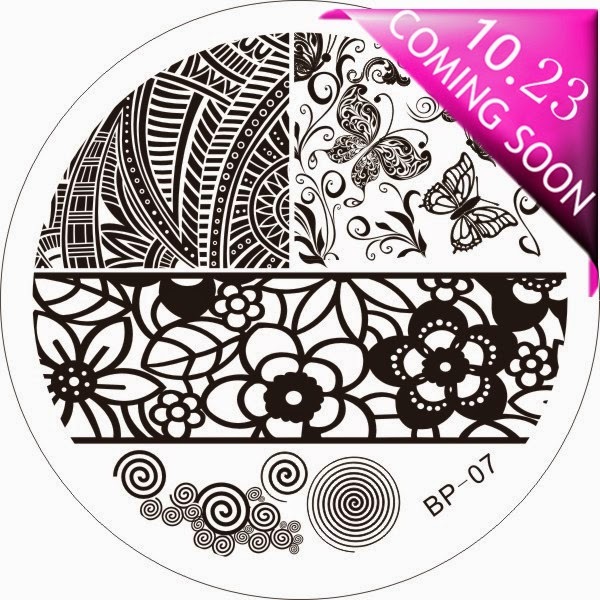 Lacquer Lockdown: Born Pretty Store Nail Art Stamping Plate Update: BP vs BornPretty Plates What's The Difference? 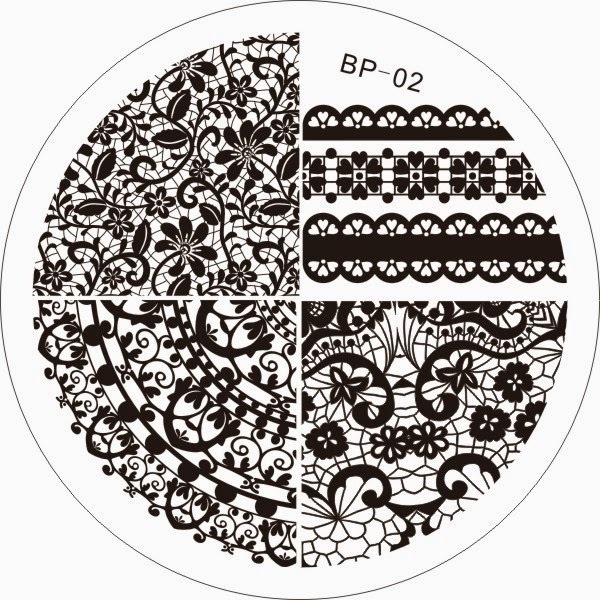 Born Pretty Store Nail Art Stamping Plate Update: BP vs BornPretty Plates What's The Difference? I wanted to address the difference in the Born Pretty Store plates when I noticed. 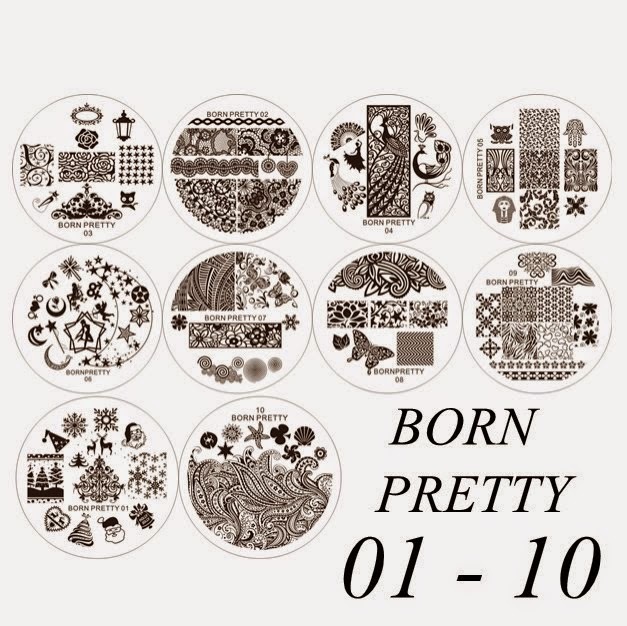 While looking through all the available plates on the website lo and behold I recognized the first set of Born Pretty plates from 1-10 and the bundle currently listed from 1-10 on the website were all different! Sigh. I can't say I'm happy about that when I noticed the first set has images that are much smaller compared to the new plates. So this is basically what happened. 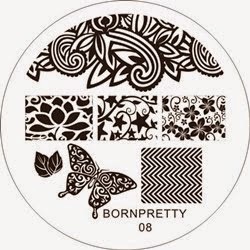 If you were like me and got the first set of plates that released from the Born Pretty Store brand they were the smaller images and the plates are labelled as BornPretty. At the time of the initial sale and release these plates were $18.39USD not the 0.99 cents per plate that was offered yesterday but roughly $2.39USD per plate. 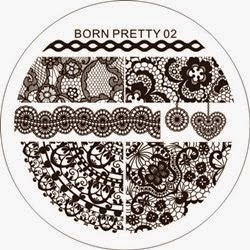 Above are the old/first release of the Born Pretty Store plates from one month ago. If you want to see close up individual images of all the plates see my original post here. 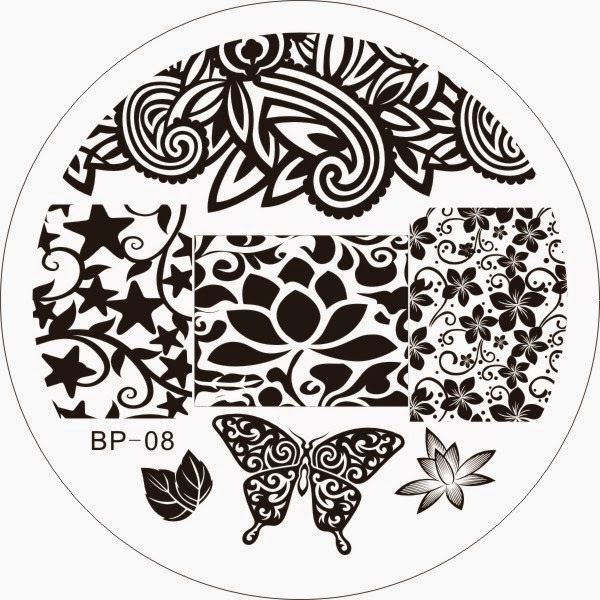 Now take a look at the BP plates which launched yesterday and are essentially the larger version of the BornPretty plates though many have been completely redesigned. 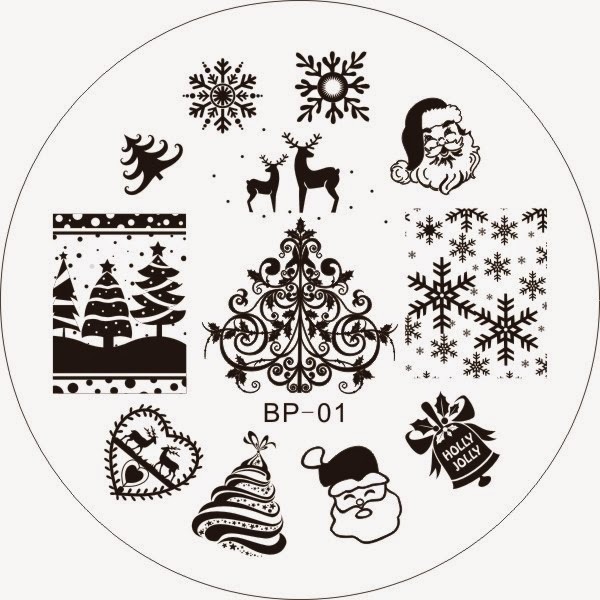 Especially BornPretty 06. I'll show you that one individually below. 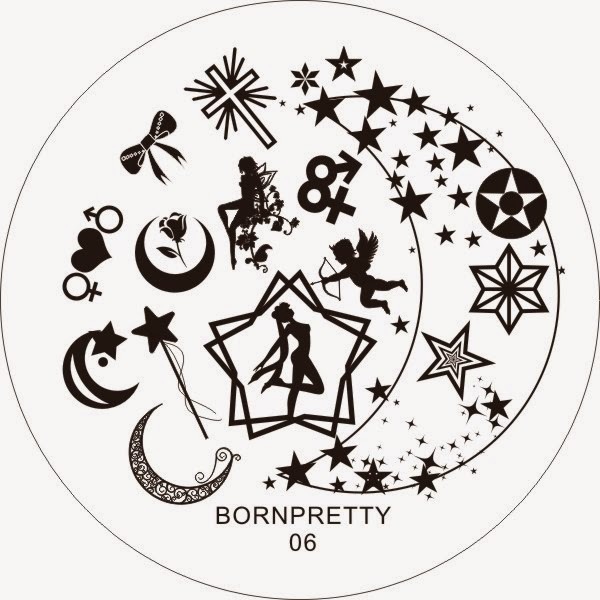 Look at the total difference between BP06 and BornPretty 06. 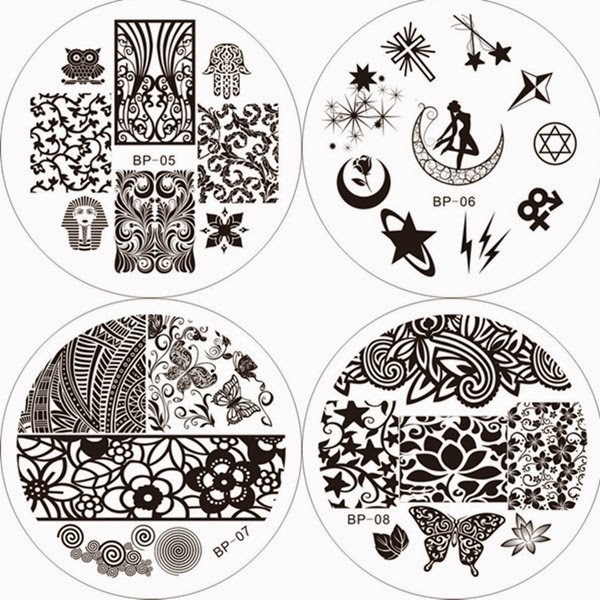 I'm a bit surprised that Born Pretty Store didn't bring this obvious change to our attention since these are clearly different plates and what's more the image sizing is completely different as well. Side by side comparisons (sorry I could not make them larger or they would go to a different line). But the difference is quite obvious. Despite the above too looking the same they aren't. 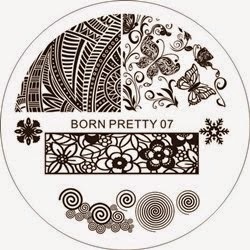 The BP01 plate clearly has different sizing and spacing compared to the BornPretty 01 original. Trust me my eye for these kinds of subtle differences is very sharp. Plus see how the party hat in the upper left is now changed to a smaller christmas tree? They removed the hat because it was taking up too much real estate and enlarged and moved the christmas tree that had been there in the original. See how the images have been enlarged and zoomed in on the new BP versions? Also the snowflakes and one of the other spirals at the bottom has been removed. And here's another prime example. Zoom, rotation, removal, and addition. Sigh. So I would do this with all the plates because they have all been changed but A, all of the individual images of the BP plates aren't up on the website and B, I think you get what I am pointing out. 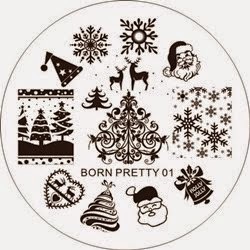 For me the disheartening part about all of this is that it would have been very easy for Born Pretty Store to post an addendum to the links on their page or in the newsletter saying the original 10 plates had been redesigned so that we knew to get them if we wanted during the 0.99 cent sale. I tried searching the site and blog and couldn't find that information anywhere. I have no problem with a brand revamping old plates Bundle Monster did it with their 2010 set, although these hardly qualify as old seeing as they just released a month ago, but I do have a problem with operating with partial information. I have written to Born Pretty to ask what they plan to do about this for those of us that ordered the originals, which I'm still waiting to arrive, and wanted the larger plates. Pretty disappointed as well. First, I'm disappointed that I still have yet to receive the first set of plates I ordered from them. Then here they go already releasing the second set?? I have longer nails, I can't use small images. So if/when the first set of plates ever makes it to me, they're probably going to be useless (and never mind that I paid DOUBLE the price they were available for yesterday!!) Second, they definitely should have made the change in plates known to everyone and even offered replacements to those that already ordered them the first time around. These plates were my very first order from Born Pretty, and I have to say, the experience is not making me jump to make another purchase!! I have to say that I am disappointed as well. I was hoping to get both of the Sailor Moon inspired plates and the original one is gone. While I understand that some of the images are now larger they are missing some images completely. I wish that there was a notice stating that they were going to revamp the old plates and it wasn't a "new collection"
You're the first person I've come across that has actually received their plates! There were issues with BPS parcels in my country (still people wait for June, July and August shipments) and I bought more than just the plates so decided to pay extra for tracked shipping. WHich appeared to be only 6 days waiting for BPS to pack the stuff and 21 days to get the envelope at my post office. I'm bummed too. My originals haven't arrived yet but I ordered all the new ones yesterday and would have coughed up for the retooled ones if I'd known how lame the original set was. I would agree the new ones in terms of design do appear a bit more polished than their predecessors. I wish they had been more forthright about the redesign I would have been fine about getting the redesigns at the 0.99cent price point and not full price considering what I already paid for the original set. Oh, no, I totally did not notice the change. I ordered plates 01, 02 and 10 from the original set, and still don't have them. And yesterday I ordered both new sets, and now wish I got the redesigned plates from the old set, too. 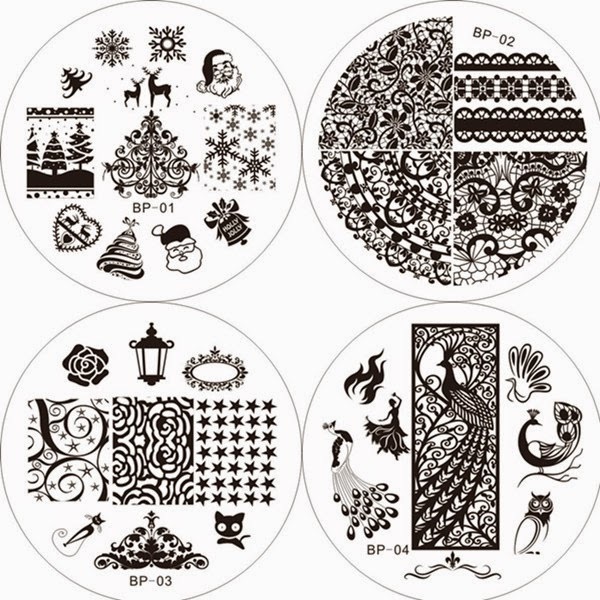 Have you tried stamping? How's the etching on these plates? You think they would have put up a least a notice about the new Sailor Moon plate. I totally didn't realize it myself. As I ordered the original set I will have that plate when it arrives but with the images being so small it may not even be worth it. Overall I agree there should have been a notice given about the revamp prior to the sale and release. Exactly same here. I would have bitten the bullet had I known just to make sure I got images that would fit my nails. Alice, I will try them out tomorrow, just those which I decided to open. I keep some unpacked for the account of my future blog giveaway. I will leave a comment here when I try them. Girl I gotta be honest, I would not give away these plates if the images are that small and so many people are upset lol! If they are the newer ones that makes more sense after all you want to win things that will be useful to you in giveaway and fun right? And I don't mean that in a snarky way I just mean with all the issues surrounding the original models it might be best to use them for yourself if you can. Wow that's the most explicit measurement I've seen so far. All of my naisl are about 1.5-2.0cm wide so I guess these will definitely not work for me. At least not without stretching the images. How was the quality of the etching? This is sad... I just seen your post and am gutted as I prefer bigger plates, not to mention the price difference! Aww sweetie yeah I'm less than thrilled myself. I think if they had just given us the notice about the change we could have at least gotten some of the bigger plates while they were on sale. I'm truly hoping they offer something to those of us who got the original plates in the way of replacement. And thank you for your kind words. I will always try and keep my readers informed as best I can! Well thank gooodness for at least that! Seriously??!!!?? Ugggg...why do this? I saw that the lace looking one was very different. Makes me so angry! I still haven't got mine either. I really like that second lace plate as well! Yeah it's definitely a non-ideal situation that could have been handled in a more forthright manner. For now I guess we are in limbo until we hear something back from Born Pretty :( As I said I'm pretty disappointed. I have checked so far just two Born Pretty 10 and 08 - both stamp really well, no issues, bold spots, missing details. No issues with regards to the quality. No more checking - it is Saturday evening and I am ready to go out! Take care, fellows! I did not want to hide the info about the image sizes - but thank you for your remark, I respect an honest advise :) I just know few very creative ladies, who make the stamping with partial images, I am sure they will be hell a lot of ready to put their claws on those plates. But - as quality of the etching is so far really good - I start to think I do not want to give anything away, lol. Oh, good, at least we have that. Still disappointed about small sizes. I am seriously disappointed by the plates. I don't have wide nails but they are long, round the 2cm. When I try to position my nails on the plate for a full image only a few would work. This is very very annoying. I would have loved to have gotten bigger images because what I have now is fairly useless to me. The zig zag image on plate 08 is one of the worst imo, great design but so stupidly small!!! 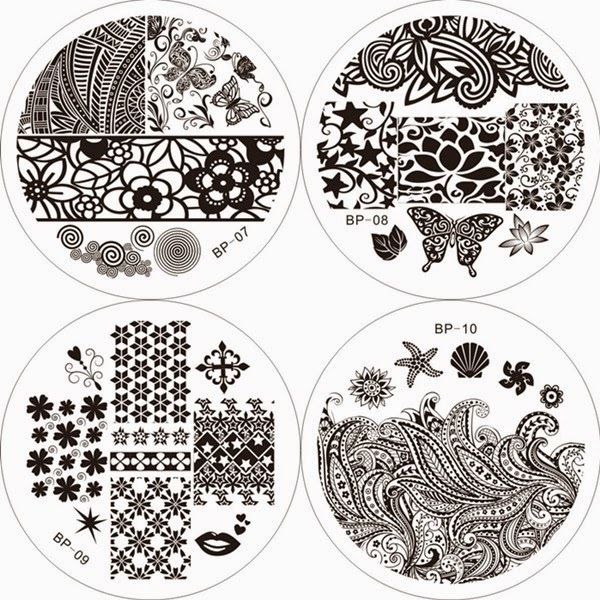 Stretching the stamper will only distort the image thus leaving it for only partial design use on the nail. So sad about this!